Combining sophisticated classroom and academic space with residence space for 460 students, the North Quad Residential and Academic Complex will provide classrooms, studios and offices for five information and communications-related university programs. The result will be an environment in which lively interactions among students and faculty spill seamlessly from classrooms to hallways to faculty offices to living quarters—all under the same roof. The architectural team of Einhorn Yaffee Prescott (EYP) and Robert A.M. Stern Architects created a design that draws on the classic features of academic architecture. On the ground level, the brick and stone building encloses one continuous interior. 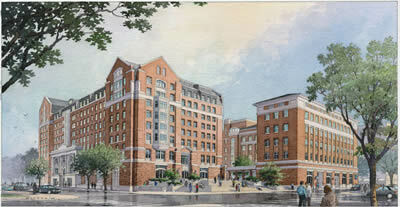 Above ground, the complex appears as two separate buildings, an L-shaped seven-story academic tower and a 10-story residential tower arranged around interlocking courtyards, and connected by a cloister evocative of the Law Quad.